Hello and welcome! 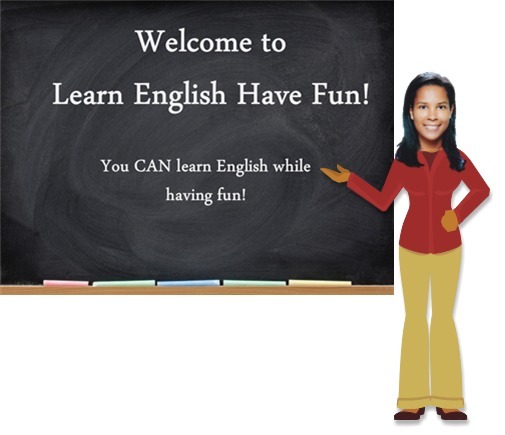 My name is Nicole and my goal in creating this website is to help make learning English as fun and enjoyable as possible. This website is especially helpful for intermediate-level learners but anyone can benefit from what's offered here. Although I'm only fluent in English, it seems I'm always trying to learn one language or another. Right now, I'm studying French but I also know some Italian, Spanish, Macedonian and Turkish. So trust me, I know exactly how frustrating language learning can be and how painful it is to try to memorize words by using flashcards. I'm simply more motivated to study and practice when something is interesting and fun. I started my career in international relations (I have a Master's degree in international economics). Later, because I love languages and want to make a positive impact on people's lives, I decided teaching ESL would be the perfect job. I got my CELTA teaching certificate in June 2012 and taught English to individuals online and in person for a couple of years. Although I am no longer teaching English at this time, I have started to create interactive digital lessons and courses. I also update this website when I can. As I've created this website, I've learned a lot. It hasn't always been easy and I've made some mistakes. But I've learned it doesn't help to be scared and frustrated. Sometimes it's just better to laugh at the situation and even at yourself. My advice? Whatever you're trying to do—whether learning a language or trying anything new—don't beat yourself up and get frustrated. Instead, be kind to yourself and choose to find ways to make the learning process fun. Believe in yourself. With time and perseverance, you can do almost anything! I try to incorporate the lesson of having fun in my teaching. Interesting lessons help my students stay motivated and consistent language study is the KEY to improving language skills. It just takes a short study session each day to make major achievements and that's why this website offers fun "study breaks." I hope you'll find these lessons helpful. Finally, since language learning is a long process and most students require a variety of learning tools and approaches, I also provide tips on language learning and suggestions for helpful resources. So now you know a little bit about me... it would be great to know a little bit about YOU so that I can be sure to add information that will be helpful for my visitors. Please click here to take a short survey about your English level, why you are learning English and what type of things would be helpful with your studies. I wish you great success in learning English and I hope you will visit again soon! PS - If you would like to receive regular updates about this site and information about my free and paid courses, please sign-up for my free newsletter.